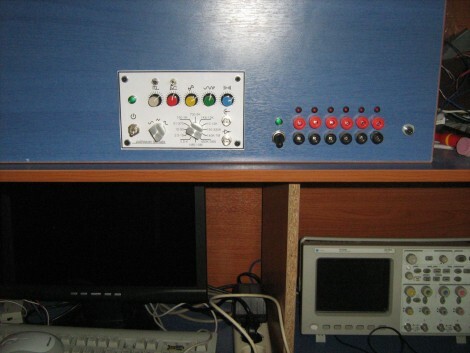 A function generator is a handy piece of test equipment to have on-site. 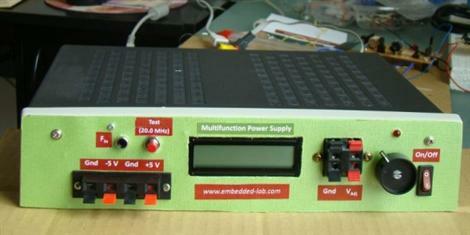 [Kammenos] designed and built his own function generator, using the bench itself as the enclosure. You can see above that the control panel presents a clean finished look. To achieve it, [Kammenos] designed and printed the panel labels on a sheet of paper, and used a piece of acrylic to protect it. The circuit inside uses a MAX038 high-frequency generator chip. This is a full-featured part that allows for great control based on a few external components. One of those is a selectable frequency range based on the capacitance value on one pin. This is selectable using a twelve-step rotary switch with a dozen different cap values. There’s also adjustment knobs for fine tuning, duty cycle, and DC offset. Check out the video after the break for a full demonstration. If you want to build this yourself you’ll need to do some chip hunting. The MAX038 is obsolete. You may still be able to find one, but at around $20 you should be able to source a replacement with the same features and save yourself cash all in one step. Concerned with your project’s power consumption but don’t want to constantly leave an ammeter wired in series with your power supply? [Rajendra] feels your pain and has recently documented his solution to the problem: a variable-output bench top power supply that clearly displays load current consumption among other things! Everything is wired up in a nice roomy enclosure that has front-panel access to ±5V and variable outputs, an adjustment potentiometer, and even an input for an integrated frequency counter. A PIC16F689 MCU runs the show and displays the variable output voltage and current on a 16×2 character LCD. Although clearly useful as is, the PIC has plenty of I/Os and muscle left for future expansion and a capacitance meter has already been hinted at as and addition for version 2! [vtol] has built a very elaborate system of electronic sound machines, which can be patched together in various ways in order to create all sorts of sounds and sound effects. The modules range from simple noise synthesizers to pitch shifters, sequencers, and effects processors. The most recent addition to his synthesizer system is a matrix sequencer named 2112, which focuses on generating random sounds from a very familiar mechanism. The sequencer simulates Conway’s Game of Life, representing the colony movements in beeps and buzzes, creating a nearly infinite array of random sound effects. Using firmware from the Game of Life board by Ladyada, the sequencer generates different sound patterns based upon the number of colonies on the board. The output varies according to the shapes and proximity of the organisms to one another. 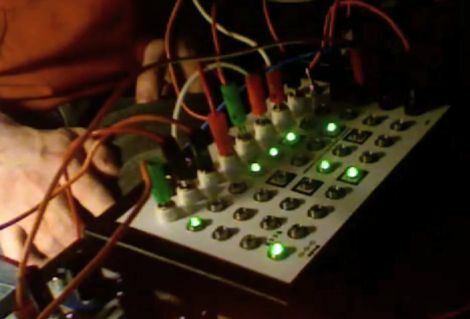 Since it is part of his already modular system, the 2112 board can be combined with any number of his other sound generators and effects machines to make all sorts of circuit bent music. Keep reading to check out the trio of videos below demonstrating the Game of Life board in action. A late hacking session, and parts-on-hand came together as the inspiration for [BadWolf’s] magnified glasses with LED lighting. This orb, when swung like a pendulum, prints images by dropping ink out the bottom. 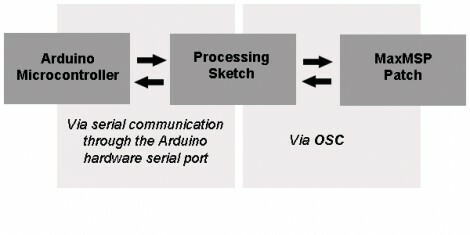 A processing sketch works in conjuction with a Wii Remote and an IR LED in the orb to sense when the print head is in just the right position for dispensing ink. [Flemming] uses a PCB fab house called ITead Studio. We hadn’t heard of it before but if you consider giving it a try make sure you look over his tips and tricks about the service before submitting your designs. [Spi] wrote in to let us know about this Java Bookmarklet he came across that lets you turn any webpage into a Katamari Damacy level. It’s a pretty clever bit of code.